Generic teaching and learning spaces become all too readily redundant due to their monotony. Space will impact on learning if it is different, interesting, inspiring and a place that you would want to be in. The building form has been derived through analysis of the available site geometries. Opportunities to complement University Drive, pedestrian pathways, the hinterland and major health developments are maximised. The form is intentionally crisp, dynamic, colourful, bold, fearless and futuristic. 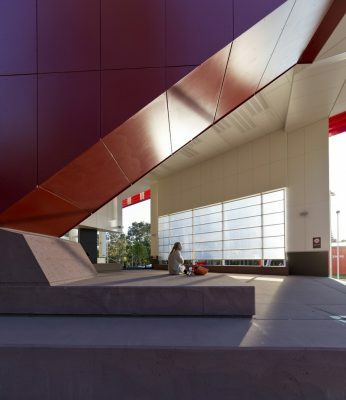 An additional entry completes a continuous pedestrian loop at the ground plane making the library fully accessible and inclusive. Triangulating new with old results in efficient travel distances, increased collaboration and sustainability benefits with the new building serving as an environmental buffer. Further benefits include conservation of native bush, less disruption to a live and densely occupied area of the campus and greatly enhanced operational efficiencies. As such, 160m of three storey construction replace the brief intent of two separate three and five storey entities either side of an ageing asset. 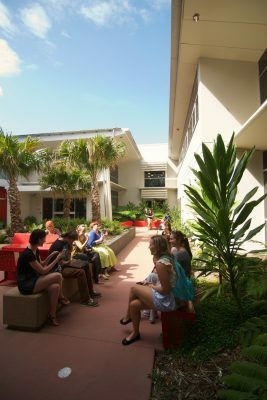 Students are relishing the connectivity, engagement and convenience. Remote deep plan areas are rejuvenated with blended indoor to outdoor learning environments. The completed building is contributing to international research in this changing typology through a plenary delivered at the Nobel Forum of Future Learning Environments at the Karolinska Institutet. The library and the extension responds to its immediate context and wider site connections. 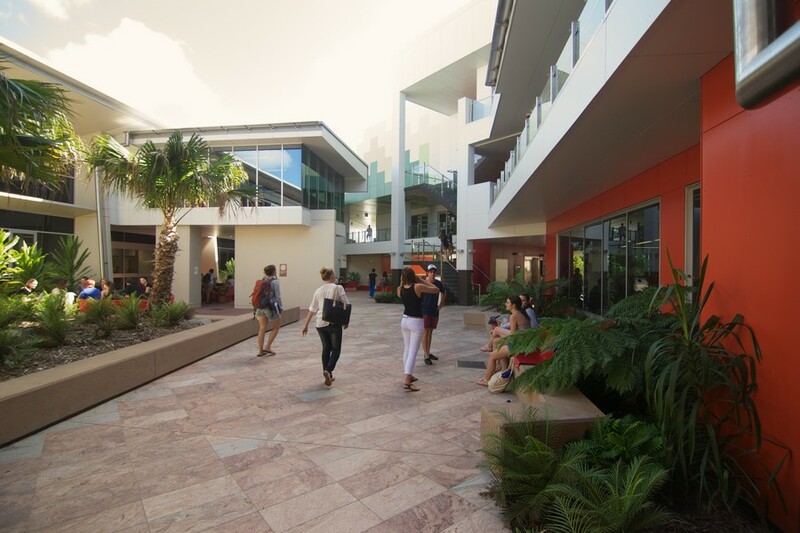 Geometries are used to engage the building visually with significant pedestrian paths that traverse the campus and University Drive. 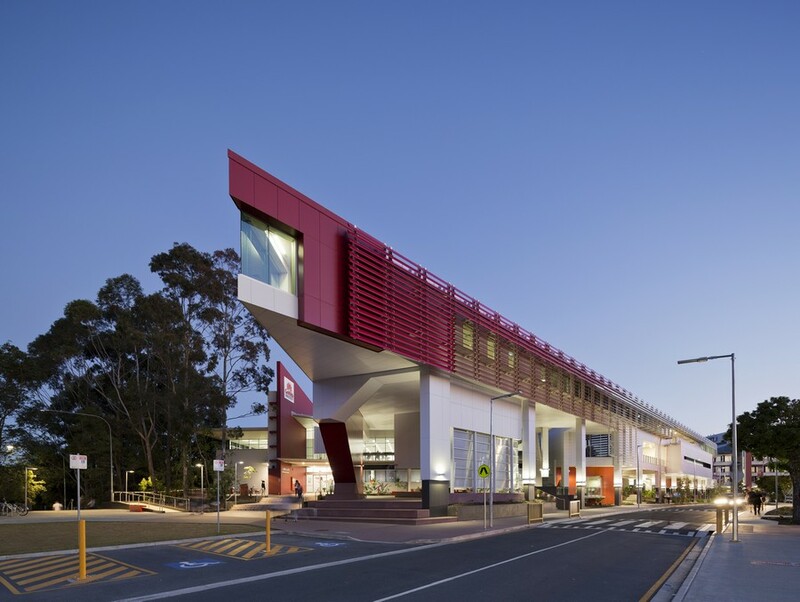 The ‘Shard’ cantilevers out towards the new light rail and Gold Coast University Hospital. A strong welcome and connection towards these $2bn investments. Undercroft spaces extend the welcome and create valuable covered learning settings that cater for the mass migration of students between lectures. 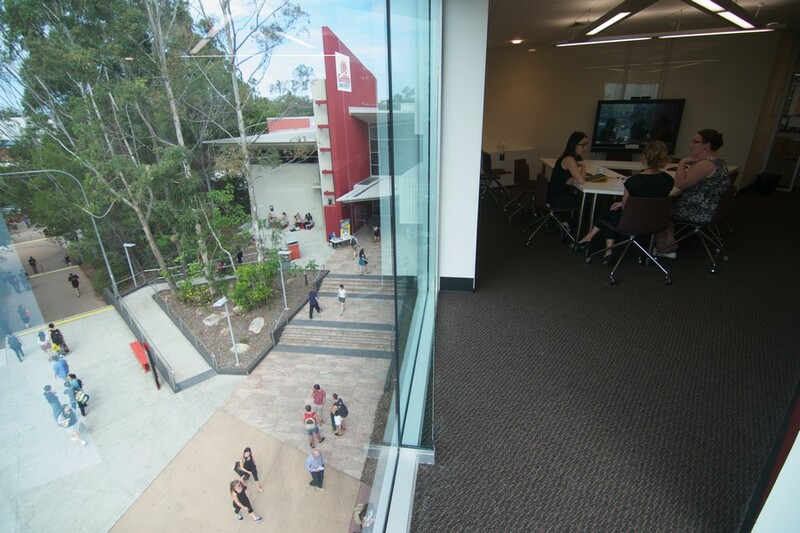 As one moves up through the building outdoor spaces engage you back to firstly the immediate context and then a connection the a wider context with the views the Gold Coast Hinterland from the Sky Lounge. The design influenced and embraced our proposed future transformation of University Drive into a parkland. G11 offers students choice, outreach and collaboration. 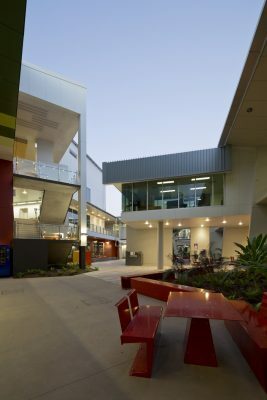 Various formal and informal spaces enable students to meet, learn, withdraw, share knowledge, take in oxygen, relax, be visible, valued, enjoy serendipitous encounters and access a myriad of support services. We have taken risks and created experimental spatial canvasses where students can express themselves. 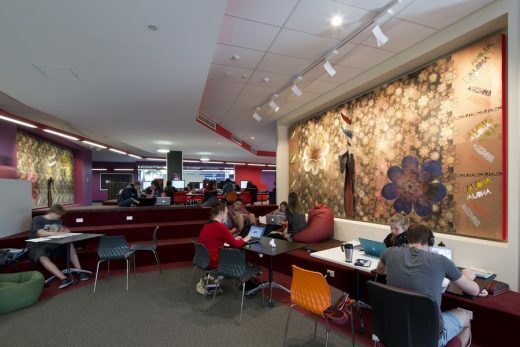 Students will utilise spaces differently at differing times of the academic year, they can lose themselves within the collection stack, attend a seminar, meet, greet, debate, recline, or occupy a quiet pocket of the library for a more intensive individual or group study. 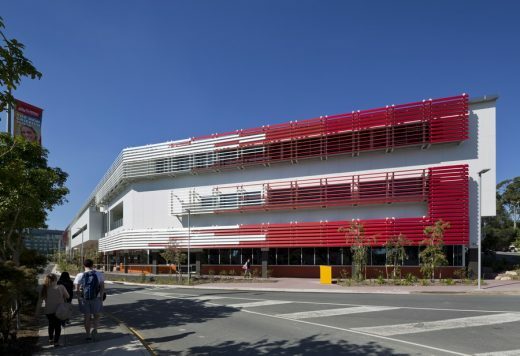 The building encourages use outside of term time and enables 24/7 use in part which is critical considering the variable courses on offer and number of students studying whilst maintaining other work commitments. The volume under the building’s ‘shard’ provided the perfect setting for a space of a collaborative and experimental nature. Fractured geometries frame this unique space which is sited adjacent to cafes, primary campus pathways and the heavily utilised library entry. 100sq.m internal briefed area is replaced with 300sq.m external covered space. This naturally lit, ventilated, spacious and quirky zone of the building provides a setting where collaboration can occur in multiple modes. 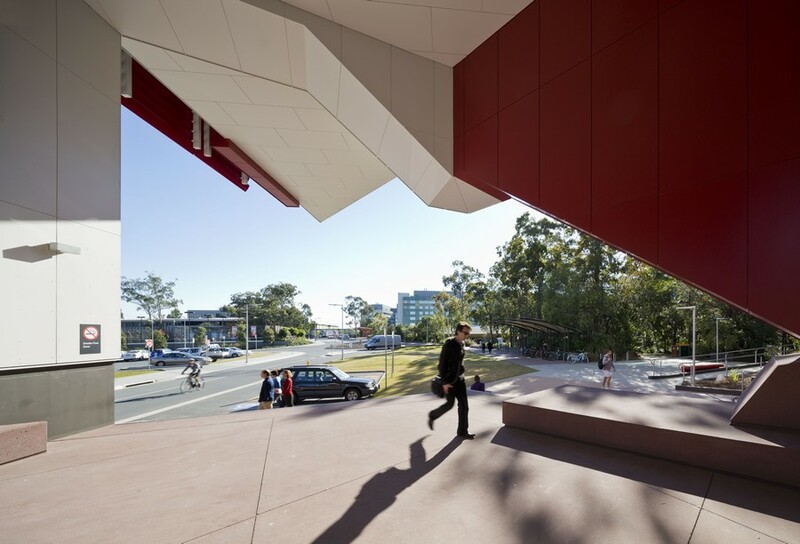 A place is created to host temporary exhibitions, a rock band, Vice Chancellor’s address, image projections, an open day, marketing promotions, farmers markets, enrolments or to merely serve as a destination and meeting point transforming campus legibility. 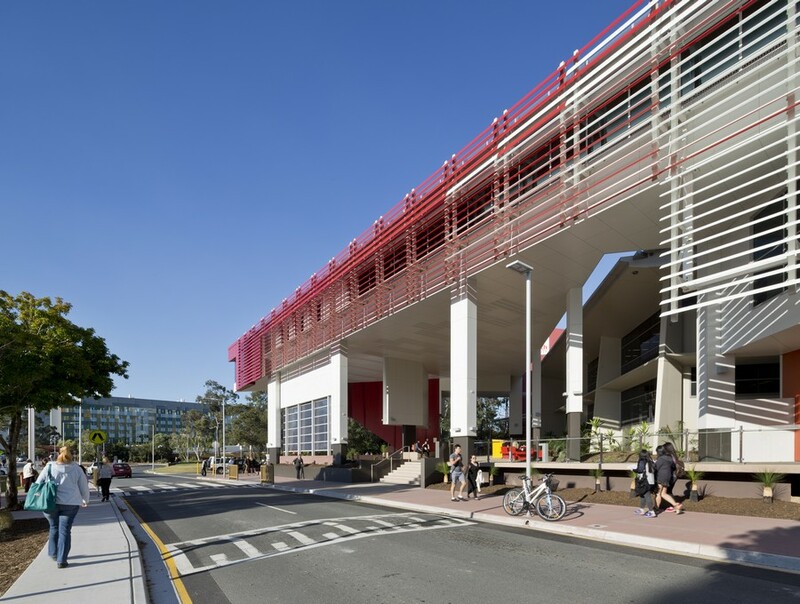 A 160m long building facing west achieves permeability through a fixed louvered second skin and 1600sqm of covered landscaped undercroft. The building encourages people interactions, there are multiple opportunities to sit, learn, relax, converse, rest, contemplate and collaborate. 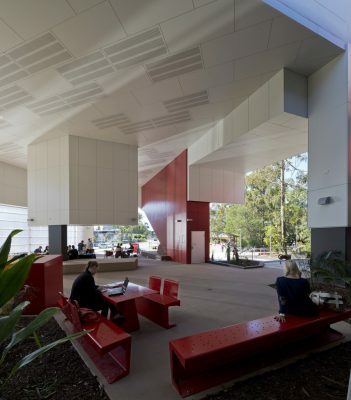 Intentionally permeable, the project is envisaged such that it will be ever evolving reminding students of a sense of place whilst embracing Queensland and Australian ideals of interacting with the outdoors. 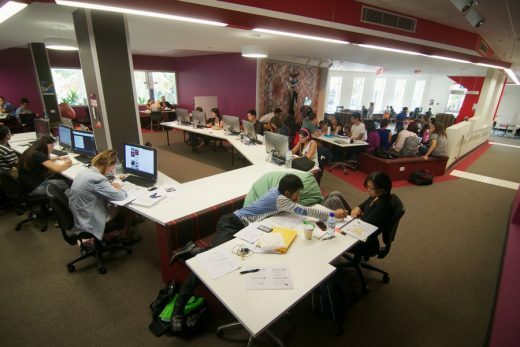 The requirement of a seminar room and lap top lounge was surpassed with the inclusion of a combined study hall. This is the first 24 hour facility for students on the campus. The space incorporates internal landscapes of terraced seating to enable formal and informal gatherings. Wi-Fi, fixed computers and wedge shaped tables enable technology to be a part of student peer to peer learning in this space. 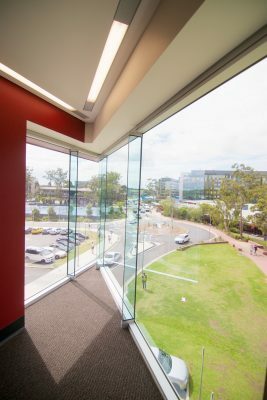 Enriched by significant local artworks, light, comfort, colour and collaboration, this space engages with the Collaborative Space to the north and the Aviary Garden to the south. 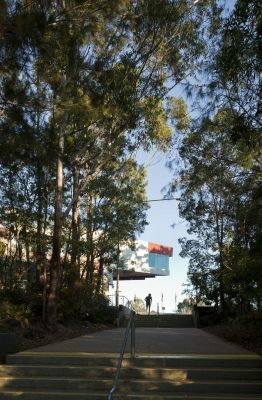 This space is the result of strong geometries and engagement with the campus and wider precinct including the eastern axis where the shard form is framed by an opening in the native bush. Careful consideration of openings minimises the heat gain on this very exposed aspect of the building whilst filling the space with light and views. A briefed ‘staff meeting space’ is rapidly becoming a sort after space to be seen to meet and collaborate. 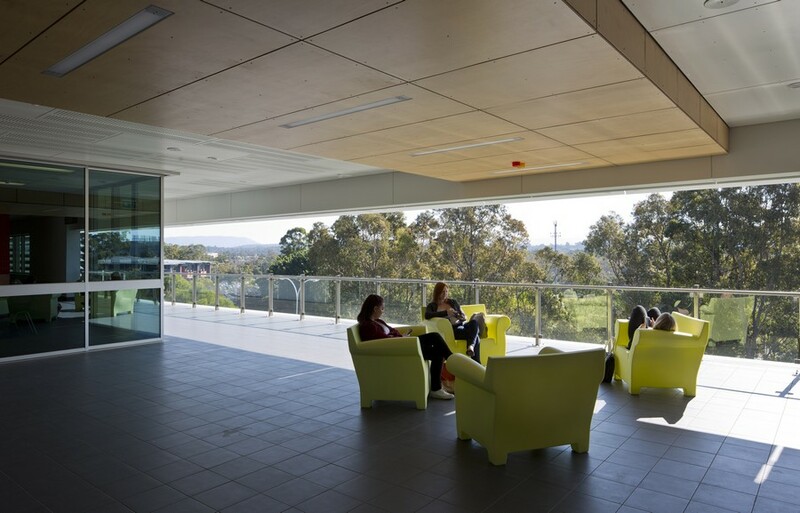 Shade, light, view, comfort, different moderations of privacy and noise are very influential factors in selecting a study space. Behavioural patterns confirm that students want to be in or near external settings that offer opportunities for learning, relaxation and escapism. Many have a desire to be seen or to work with an outlook, they migrate en-mass to sociable hotspots and they enjoy studying as a part of a wider conglomerate. Such behavioural observations complement the librarians ‘aviary’ analogy of students occupying the fringes of space at different levels. 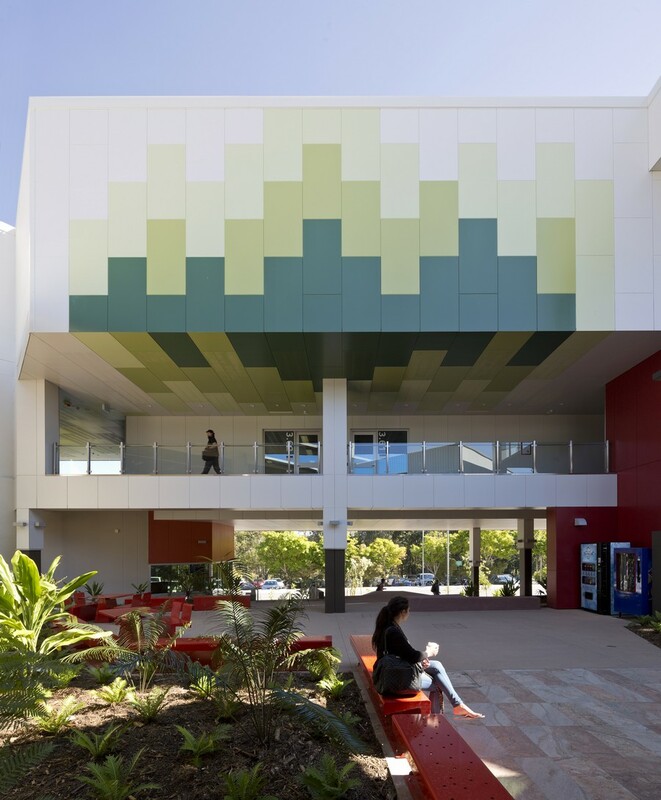 Fresh air, ever changing colourful skies, lush planting and a diverse array of seating styles were planned to support changes in semesters and realise a stimulating ‘aviary’ learning setting. 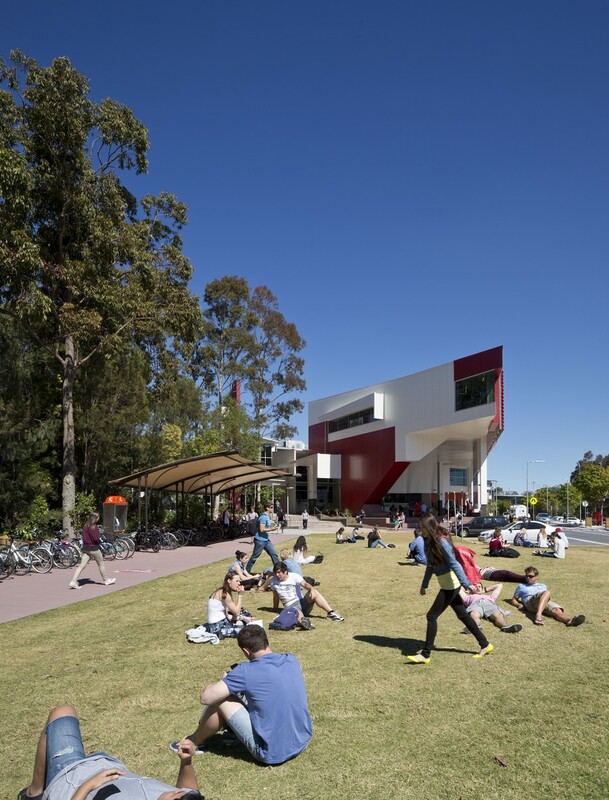 The concept is very inclusive, permeable, open and welcoming expanding and translating the Universities character and ethos in the built form. Significant passive benefits exist with a stack effect of natural ventilation, an abundance of natural light and surveillance. This is a permeable space that encourages students to work individually and collectively and as one interprofessional learning community. This is particularly appropriate considering the inter-professional educational trends of the health precinct. A feature quiet room is accessible off the extended collection floor and this space enables further enjoyment and activation of the aviary. The sky lounge frames views of the hinterland uniting G11 with the cultural heritage of the land. This non-briefed space derived through return briefing can serve multiple functions such as student and staff consultations, corporate events and more contemplative learning and discussions. An 80 person seminar room is sited adjacent enabling this space to break out into the lounge maximising the versatility and bookable value of the space. The lounge also serves as a centrally sited break out space for staff with the consultation pods used for more confidential small group meetings and interviews.